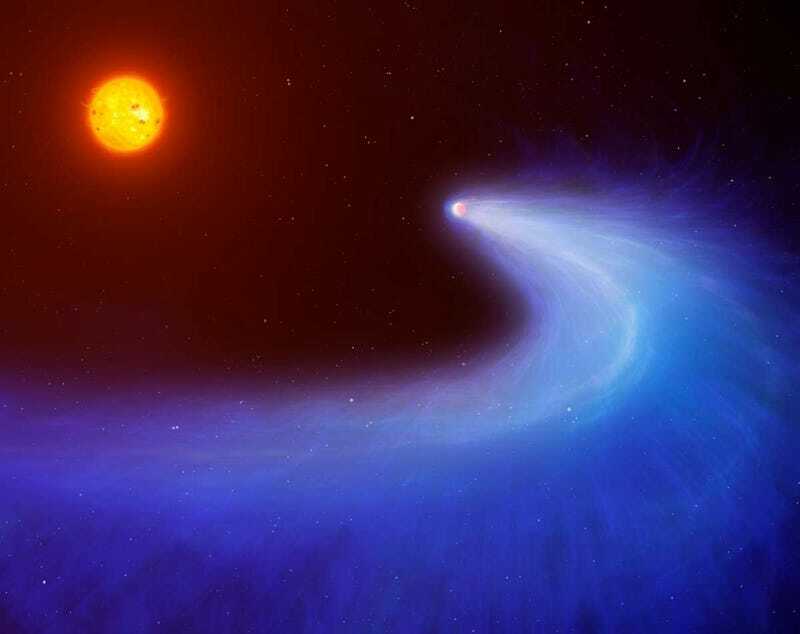 Astronomers have spotted a Neptune-sized planet with a rather unexpected feature—a comet-like tail that trails for millions of miles. Nothing quite like it has ever been seen before. The exoplanet, GJ 436b, is located approximately 33.1 light-years away and in orbit around the red dwarf,Gliese 436. At 2.5% the luminosity of our Sun, this star cannot be seen from Earth, but its x-rays are causing a very strange phenomenon on GJ 436b—a giant comet-like cloud of hydrogen that’s bleeding out into space. Artist’s impression of GJ 436b at the beginning of its transit. Observations from the Hubble Space Telescope and the Chandra Observatory show a transit signature that’s deeper and longer in the optical spectrum, leading astronomers from the University of Warwick and the University of Geneva in Switzerland to conclude that this cloud is both enveloping and trailing the exoplanet. The results of their work can now be found at the science journal Nature. Estimates place the size of the hydrogen cloud head at about 1.8 million miles (3 million km) across, while the length of the tail could be as long as 9.3 million miles (15 km) long. What we can see is a large cloud of hydrogen gas absorbing the light from a red dwarf star as its exoplanet, GJ 436b, passes in front. The cloud is created as of result of x-rays emitted from the red dwarf burning off GJ 436b’s upper atmosphere.The cloud forms a comet-like tail as a result of ultraviolet light coming from the star pushing on the hydrogen and causing it to spiral outwards. Around 1,000 metric tonnes of hydrogen are being burnt off from GJ 436b’s atmosphere every second; which equates to only 0.1% of its total mass every billion years. The same process is likely to be much stronger on other exoplanets, where the entire atmosphere could be removed or evaporated to destruction. The study shows that exoplanets that orbit closely to their parent stars may lose some fraction of their atmospheres on account of the extreme irradiation. Previous studies have suggested that other gas giants might be experiencing similar effects, but this is the first planet for which a comet-like tail has been confidently detected. Read the entire study at Nature: “A giant comet-like cloud of hydrogen escaping the warm Neptune-mass exoplanet GJ 436b”. Contact the author at george@io9.com and @dvorsky. Top illustration by Mark Garlick/University of Warwick. Bottom illustration credit: D. Ehrenreich / V. Bourrier (Université de Genève) / A. Gracia Berná (Universität Bern).